My Father Charles Smith started working for A.J. Farrow in early 1907 aged thirteen. In those days if you had good attendance record at school and a widowed mother (5 children at home) and a job to go to a boy could leave. His first job would probably be pumping water to a tank in the roof for household duties etc, cleaning shoes, feeding dogs, etc. He never told me what he did but I should image with the steam engines about he would soon want to be involved. As time went on he helped the older men in maintaining the engines, threshing drums etc, and learning to drive one. In the First World War he and Robert Girling took an engine, trailer and living van and carted material from Harling Road Rail Station to East Harling Air Field, coming home Saturday pm, and going back Sunday pm, by train to get steam up ready for Monday morning. After that there was general haulage nearer home. Threshing was the main occupation for several months of the year (4 threshing outfits). By that time post war lorries came into the business. My father kept threshing on farms till about 1925-26, when A.J wanted him to stay in the yard and more or less take control. It did not go down very well with dad because he would loose his board money, money paid by the farmer to the driver and feeder (one wage between them) but that was resolved with A.J. 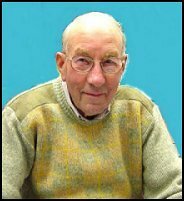 By then Gerald was very much involved in the haulage and more lorries came and had to be housed and maintained there was a big problem of building, housing for the lorries, workshops, stores etc. Gerald, A.J. and my dad were chief architects, over the years he was carpenter, blacksmith, welder, engineer, always at someone's beck and call. When it came to getting drums ready for the next season, he would do that in the evenings, when he was alone. In the fifties when steam went out he adapted himself to Marshall Diesel tractor and combines and most modern things it must have been heartbreaking for him when A.J. passed away in 1953 and Gerald in 1961, they got on so well, the engines broken up and all his life's work came under the hammer. I started work at A.J Farrow's in January 1934 doing similar jobs as my father did in 1907 but by this time there were cars to clean and keep full of petrol and various odd jobs in the garden. Later on I helped in the workshop, at seventeen I got my driving licence and did various delivery jobs with a van and a pickup truck, I also went mate with various drivers. When I was twenty one I started driving small lorries (about 1 ton capacity) moving various material from rail stations to airfields about Norfolk. Cattle food also came by rail at Yaxham and stored for delivery around parts of Norfolk, malt from Dereham and Ryburgh to breweries, sugar beet from farms to factories and in the fruit season blackcurrants from growers to Norfolk Fruit Growers of Wroxham and Chivers factory Histon Cambridgeshire. For several years my main job was delivering cattle, pig, and poultry food from the store to a large area of Norfolk, which was brought in to store by our lorries from London almost daily. Born in the June quarter of 1871 at Burringbourne, Cambridge the eldest son of John & Sophia Farrow A.J. appears on the 1881 census living at Shop Street, Whinburgh. It is noted that the name was written as Farrer. In fact all previous family records are recorded as 'Farrer' Athur's father was born a Carbrooke as John Farrer. A.J. Farrow married Florence May Critoph, born in 1875 at Yaxham, Norfolk. Flora was the daughter of William & Mary Critoph, Miller of the Mill Yaxham, Norfolk. Flora prefered her middle name and was alway known as 'May'. 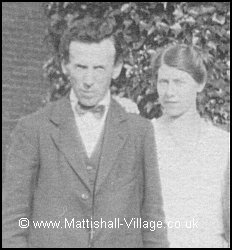 The Farrow family came to Mattishall from High House Farm at Beetley and were living in Mattishall in the 1901 census. John Farrow came to farm South Green Farm and with him came Mr Dye and family. Mr Dye was heads teamsman and some of his grandchildren worked on the farm until the family went out of business in 1968. He also went into the threshing business with drums and straw elevators. 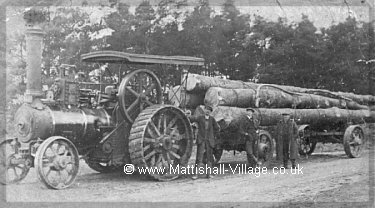 As the business expanded with more engines, a lot of timber was hauled from various parts of the County for Hobbies Ltd, Dereham and Granes of Fransham, Dereham, and others. Beer was another commodity from Cooper Brown's brewery in Norwich Street, Dereham to their store at Cringleford. By this time A. J. Farrow had acquired a steam wagon, which was quicker than the steam engines. Some of the first sugar beet grown in the country were carted from Honingham Estate owned by Sir Ailwyn Fellowes to Dereham and Yaxham stations. 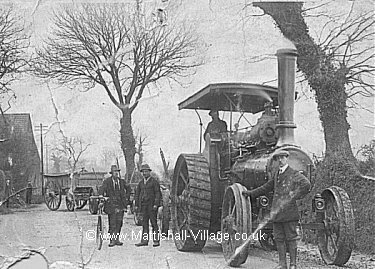 Dereham Road facing Mattishall from Yaxham about 1907.
background: A. J. Farrow is standing in front of the engine. The driver is James Orton and in the centre is Walter Woodrow. Coming out from behind the hedge on the far left is Charles Smith father of Russell Smith. Another yearly job was to take the Sunday School children to Ringland Hills for their annual outing, for how many years this was done is not known, but in the later years when the lorries came along they went to Great Yarmouth. During the first world war a lot of work was done for the War Office, and one engine and wagon was for a time working from Harling Road Station to East Harling Airfield carrying road building materials, supplies etc. The driver and his mate lived in a shepherd type living van and came at weekends, returning early Monday morning to get steam up. 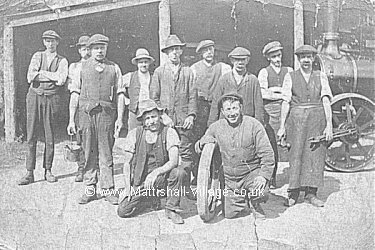 Prior to the war the yard at May Farm had been partly developed with workshops - machinery, carpentry, blacksmith and those built to house drums, pitchers, engine, timber etc. A. J. Farrow also asked Hobbies of Dereham. To build him a 40 foot heavy portable saw bench, it was hired to various estates in Norfolk in the summer, to saw trees into boards, etc for maintenance on the estates. In Farrows yard, about 1920. After the First World War when the two sons were able to take part in the business, A. J. Farrow went into road haulage. The first lorry, I am told was a Ford that carried about 3 tons - next were ex-service vehicles. 3 R.A.F. type Leylands and one Thornrcroft. Mr Gerald was the first driver (he latter became overall manger and Mr Ronald went into farming). The drivers after Gerald were; F. Clark, F. Green, A. Minns, J. Richmond, E. Peachment, C. Rudd, R. Matthews, S, Rose, Rollo Smith, J. Medlar, C. Howard, G. Futter, J. Crammer, S. Taylor, J. Woodhall, F. Woodall, A. Blanch, W. Garner (who was also a threshing engine driver), F. Woodrow and A. Housego. front Bertie [Tina] Woodrow and Jimmy Isbill. In the thirties the older lorries were replaced by larger and faster ones. Ford Articulated, Leyland Beavers with trailers, Leyland articulated and Leyland Lynz type, One Studebaker and two Lynz commandeered for War Service. The type of work changed. Malt from F. and G. Smith Ltd, Dereham and Ryburgh to several breweries around the country, corn from farms to mills and maltings and granaries in various parts of the country, house removals, fertilizer from Ipswich to farms and for a period in a specially designed lorry, pigs to Harris Bacon Factory at Ipswich and cattle slab cake from Masons factory at Ipswich to Norfolk. This lorry had advertising boards on the sides, changeable for whichever load it was carrying. For two or three summers they carted thousands of Hazelwood Faggots from Mr. Ashley Flatt's woods at Saham to King's Lynn to reinforce the banks of the Great Ouse. Later after the War several loads of faggots were taken from Honeypot Woods at Wendling to King's Lynn and also from Wayland Woods near Watton. Nearly all through the thirties till the war a lot of vegetables from various farms in the area were taken to London Markets, Covent Garden, Borough, Spitalfields and every time a lorry was in the London area it brought back a load of animal food from Silcocks Silvertown Mill for storage and delivery in Mid, North and West Norfolk. The firm held that contract for almost 40 years, in the early days it came by rail to Yaxham Station, and also during World War Two until transport restrictions were lifted, it was then carted to Mattishall store. We must not forget the main contract for about 50 years, sugar beet. We wonder how many thousands of tons were carted to Cantley, King's Lynn, Wissington and Bury St Edmunds factories, and beet pulp brought back to farms, all loaded by fork and mostly unloaded the same way. If you were lucky the chances were about 50-1 you got washed off. Until the end of the World War Two, beet in Wissington were unloaded from lorries into railway trucks by fork because the original factory was built for rail and river traffic and the rail siding was nearly a mile from the factory, very seldom seen through fog and mist. 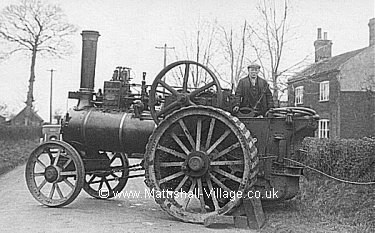 Farrows Traction Engine, February 23rd 1938. Boaz Dodman pulling a lorry out of a pond on Dereham Road, Mattishall. The lorry was owned by Messrs Semmence of Wymondham and driven by George Palmer of Wymondham who fortunately escaped unhurt. 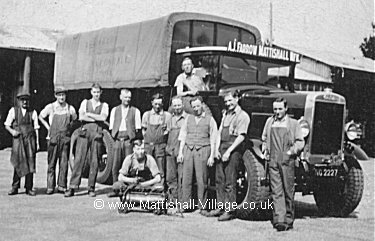 In the Late thirties and forties A. J. Farrow bought out small threshing contractors, E. Matthews of Welborne, Evans of Dereham, Goddards of Shipdham and W. H. Law of Hockering (eight more employees). 1939: A collection was made to purchase a wedding gift for Eileen M Chaney who married Gordon P Lincoln at East Dereham on Easter Saturday, April 8th. The list consisted of 50 employee's, each gave one shilling. Their names were: R Smith; C Daynes; C Howard; A Houseago; C Rudd; C Eke; J Meddlar; C Pyman; S Taylor; G Marsham; J Woodhall; M Beavis; S Rose; A Stagg; J Richmond; A Woodrow; F Woodhall; R Deamer; F Clarke; F Green; E Peachment; A Blanch; J Cranmer; W Hall; L Wells; C Orton; C Smith; F Futter; R Smith; G Pearce; G Futter; F Woodrow; W Garner; D Barnard; P Arthurton; T Parnell; H G Smith, Dereham; R Taylor; B Woodrow; James Orton; J Isbill; W Hudson; W Woodrow; B Dodman; G Hannant; E Bowman; R Meachen; B Webster; G Green; T Matthews. During the war if you wanted to keep your company private (not nationalized) you were restricted to 25 miles from the depot so long distance work stopped, and petrol rationing was in force. Most of the lorries were on Ministry work, cement, tarmac, asphalt, etc from rail stations in Norfolk to various airfields. Some of the larger lorries had drop side bodies fitted to carry sand, shingle etc (the bodies being made on the premises) - Farrows was a D.I.Y. firm. All Lorries, engines and drums, were repaired and buildings built by their own staff. About 1940 A. J. Farrow bought Grove Farm, (260 acres) at Mattishall Burgh from Mr. C. Faircloth who retired, and during the next year hired Rookery Farm (150 acres) from Mr. C. Gricks through the war agriculture committee. Mr Ronald was already farming South Green Farm of about 240 acres. During the war grain and sugar beet were still carted to granaries and factories, permits being required to travel to Bury. For 3 to 4 years during the war blackcurrant growers in this area took their crops to Hardingham Mill where Farrows had a steam engine to steam and pulp the fruit. 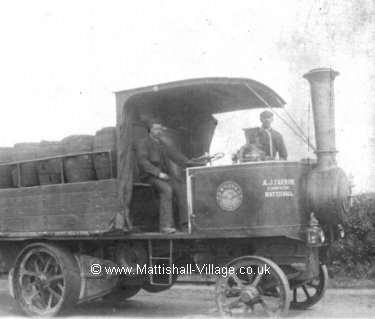 It was then put into barrels and taken to Hardingham Station for transportation to preserving factories. Some of the lorry drivers found other employment during the war but the rest of us kept in touch. We were a family if you like to put it that way, we all grew up together. Likewise some of the older steam drivers reached retiring age, but after the war they were replaced by the next generation. [the grease monkey]crouching in the front. 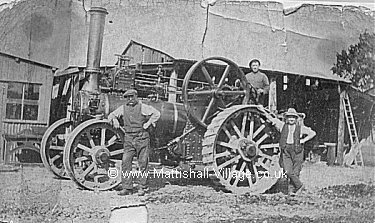 During the late forties and early fifties steam was replaced by diesel Marshall Tractors for Threshing, and next came combine harvesters and new lorries. During the war as you have read blackcurrant growers took their fruit to Hardingham Mill, but after the war it was reversed and the firms lorries collected the fruit from a large area in Mid-Norfolk and took it to Norfolk Fruit Growers at Wroxham. In the height of the season the fruit was brought to the firms depot and loaded on to our lorries and trailers and taken to the Co-op factory in Manchester. Cattle food was brought on the return journey from "Silcocks" of Liverpool. A few smaller loads were taken to Chivers of Histon - this contract lasting several years. Alas in 1953 the Govner A. J. Farrow died and Mr Gerald and Ronald carried on. Another sad sight, eight steam engines were cut up for scrap. A. King of Norwich paid £25 each for them, fortunately two had been sold to museums at Stowmarket and York. One of the 1936 six wheeled Layland lorries is in a collection in the West Country. Farrows carried on as usual until another sad blow, Mr Gerald was taken very ill and passed away in June 1961, aged 60. Ronald then brought Mrs Gerald in as a director and Miss E. Jolly was Manager and Secretary a post she held with Mr Gerald since 1939. At that time big changes were taking place in the haulage business, sugar beet forks were a thing of the past, loaded cleaners, bulk tippers, larger lorries, corn and malt sacks disappearing (bulk again) and there was no family to take over so the haulage side was sold. This was bought by Walpole and Wright of Dereham. The transfer date was 1st June 1964. Rookery Farm at Mattishall Burgh had been returned to Mr Gricks and Grove Farm at Mattishall Burgh was sold along with all the implements from farm and yard in 1966. Mr Ronald retired and sold South Green Farm in 1968 to Miss Crane. Here endeth an almost seventy year chapter of the twentieth century of a respected family firm. 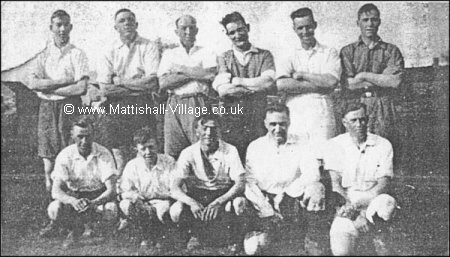 Mattishall's AJ Farrow football team…. A.J. Farrow, an athlete and cyclist in his early days, was always very interested in football and very supportive of the cricket team. As there was no playing field in the early days, A. J. Farrow would manage to persuade some farmer in the village to let the cricket team have part of a meadow for the season. The football team were luckier, there was always Mr Turners meadow (now Willow Close). A. J. Farrow was very pleased when Mattishall Cricket Club won the Norfolk Saturday and Thursday Junior Cups in the same season, 1936, a feat never accomplished before or since. Several players in the football and cricket teams worked for A. J. Farrow. He also played bowls for Dereham King's Arms. Gerald and Ronald played football for Mattishall in their early days. Ron was more interested in cricket and was captain for several years. Also as most farmers he took up shooting. Gerald on the other hand took up golf, pre-war at the Royal Norwich Golf Club. The firm also had a stand in the Old Agricultural Hall at Norwich and Gerald used to attend every Saturday. After the war he took up rifle shooting and was a regular attender at Bisley. Mr Ronald gave half the land where the village hall and playing field is and Mrs Gerald had the gates made and put up in Gerald's memory. I hope through these pages people can read of a little history concerning the Farrow family, it was the largest firm and employer in this village. I am sorry I have only named a few people from the early days, over the years there has been well over a hundred down the yard and on the farms and several of us are still about now. My apologies for any mistakes.